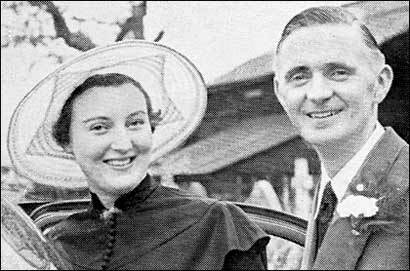 The two smiles belong to Mr. and Mrs. Billie Causebrook photographed after their marriage at Milton Ernest. The bride, formerly Miss PAULINE BRADLEY, is a member of the "Evening Telegraph" staff at Rushden. THE roar of pencils was silenced (as they say) at the Rushden office when reporter Pauline Bradley, having decided on a marriage "special," faced a variegated audience into which had crept representatives of Park Road and Wellingborough. All offices within reach had dubbed-up for a bedroom rug which L. V. Elliott somewhat sheepishly handed to the beauteous recipient with best wishes and also jn compensation for a long and embarrassing speech. At least, it should have been embarrassing, but Pauline is not the girl to blush for nothing: she took the leg-pulls  and the sheepskin in her stride, shot back a few crisp sentences and smiled her gratitude and pleasure. Pauline had been told that journalists never get cold feet: steps had therefore been taken to ensure hers being warm "in those delicate moments associated with retiring and rising." Listening from Wellingborough via land-linethe telephone, in factwere Clifford Garrod and W. J. L. Gotch. They reported good reception, marred only by a failure to grasp the nature of the present, which they deduced to be a hot water bottle. To cut the story short, Pauline became Mrs. Billie Causebrook at Milton Ernest. Her beloved, a shoe designer for British Bata, Tilbury, is the son of Rushden parents.